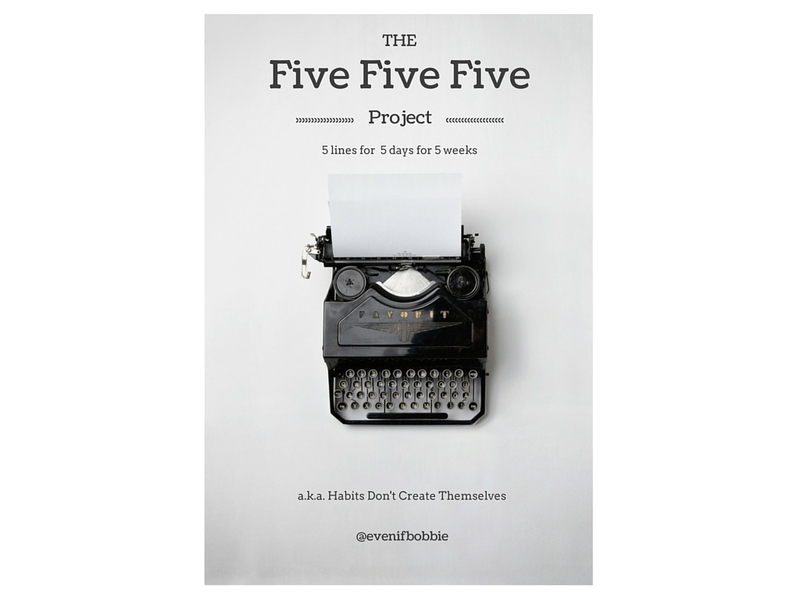 Write five lines, five times a week, for five weeks. That’s all. That is all I need to do. If I write five lines I am all set, whether they follow a theme or not. Participating in Snail Mail My Email in November. Being able to do a proper headstand and handstand. Something else I can’t remember that I guess was not important. For the purposes of informing my public writing practice, I am going with 5, 5, 5. The objective of this exercise is to write five liner posts five times a week for five weeks about anything I want to (which I have always done anyway) and be done with it. They can be bullet points, a paragraph, random disconnected lines, or phrases on a topic. They may all be mine, but they may also be borrowed poems or cited text if I so feel the urge, and if that happens, I will credit appropriately because I have some integrity for goodness sake. Establishing the habit of posting regularly within a structure, but with plenty of freedom is the point of this exercise. Also, not overthinking is its own reward. I intend to do ‘normal’ posts on top of this project, but to have this project going will give my laptop some love five times a week, and since I am already sitting here, I will (as I am now) likely start writing something more. So here I go with another series/ project, and let’s see if it serves me well for five weeks. We are on week 1. To me, the online week runs from Monday-Sunday. It is Wednesday. I have four more posts to go until Sunday. I’ve got this. And look at me, I am already well over five lines. If I were a cheater I’d split this baby up into three posts, but then each post would make even less sense than this one all rolled up together! I would ask you to bear with me, but a part of me is hoping you already love this project idea. I absolutely love this idea. Just getting thoughts out onto paper (or screen, etc.) is a cathartic process. Doing so in such an accessible way is nothing short of brilliant. I look forward to seeing what comes out of it! Mackenzie, thank you for this! This is so encouraging and I hope you follow along. How did you come across my blog? I write in my journal daily, but lately I have been so ‘stuck’ on the whats and musts of blog posting that I have gotten too much in my head and not sharing my writing as much as I would like to. This exercise sits well with my mind and gut. Thanks again! I’m always on the lookout for interesting new writers, particularly ones who speak with honesty about the world around us. Totally love this and feel inspired. Our blog has fell by the wayside, but this would be a great way to just get it going again. Can’t wait to read the next ones. So in love with this project. I need something similar to get back into the swing of things! This is so nice to hear, Katie, thank you! So happy to ‘see’ you here following along! When you find a passion project/ exercise that will enliven your practice in writing or in your calligraphy I hope you tell me about it! It’s been so helpful to my habit forming & thinking. I highly recommend pursuing a project.